What to put in an empty box in the Pataphysical Slot Machine? 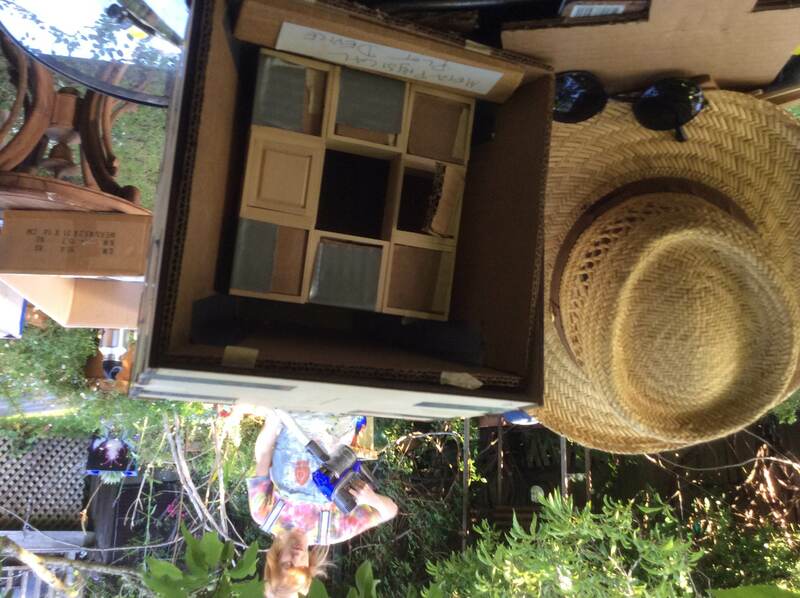 I pondered the space of a box in a cabinet - my first idea was to put up a curtain of hair and have people reach through. I shelved that idea when I wanted to build "Metaphysical Plot Device" inside the Pataphysical Slot Machine. , wherein I can provide a cabinet within a cabinet experience of absolute truth amidst the Pataphysical play. I discovered dollhouse cabinets and purchased a grid already built to save myself from learning cabinet-making in miniature. My first impulse was to populate the cabinets with 3D-printed white translucent spiritual symbols occupied by programmed LEDs. Howard pushed me to consider video. Since I spent the last year producing videos for The Justin Hall Show, video monitors in these cabinets seemed like a good way for me to explore other video display. I want to figure out how to embed a number of video monitors behind each of the dollhouse cabinets. Behind all the screens stacked together is an area area 6.25" tall and 6" wide that I'd like to fill with video. Nowadays tiny LED TVs are very small. Wouldn't it be cool to have nine cabinets, each filled with their own moving picture? I posted on Adafruit: "One Raspberry Pi - multiple TFTs or LCDs?" and got no reply, so I realized 9 tiny TVs with different signals would likely each require their own Raspberry Pi. That would dramatically escalate the complexity. 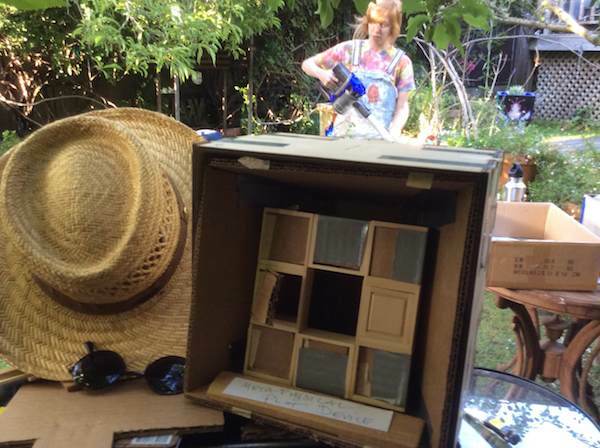 On August 9 2014 I purchased a 10.5 inch 26cm screen to sit behind all the boxes. The HDMI+VGA+AV+Audio Controller board KYV-N3 V1+10.4inch A104SN03 800x600 lcd from eBay for $128.99 - shipped free from Shenzhen China. I was fortunate that Tim Požar was building a Pataphysical slot machine box with a video screen from eBay before me and gave me guidance on setup and shopping. I plugged in the monitor to the Raspberry Pi, installed Wheezy / Raspbian . I tinkered with /boot/config.txt setting hdmi_group=2 and hdmi_mode=9 to set the monitor to 800x600, 60 Hz. I edited /etc/default/keyboard, changing XKBLAYOUT="gb" to XKBLAYOUT="us" so I didn't lose my mind during terminal debuggery. # Continually loop and pick a random file to play back. In this bash script the “for” line will loop indefinitely with the empty arguments. “find” gets a list of files in a directory, “shuf” picks a random file and then hands it to the omxplayer through “xargs”. The “-b” argument for omxplayer just makes sure the background (side or top bars) are blank. So videos just start to play on boot. Adding the “> /dev/null 2>&1 &” will start the script and background it so you can still login into the box to control it. More research in Seamless Looping for Raspberry Pi and omxplayer loop script. Using Procreate on the iPad, I drew a number of basic drawings. I exported the movies of my Procreate brushstrokes. Then in Final Cut Pro X on the Mac, I edited all 8 or 9 moving images into a single moving image. As I bury the screen behind the the dollhouse cabinets, it's getting harder to see the bottom-edge of the screen through all the surrounding bass wood. The bottom edge of the screen is where important Terminal commands are send and received, so Tim suggested I install a VNC server on the Raspberry Pi so I can manipulate the device remotely! Following those instructions I was able to get the server running on the Pi in about 5 minutes, and then I installed the Java version of TightVNC RealVNC and can now tunnel into the device from my Mac. I upload videos for the device onto the server and then wget the URL. I downloaded a test pattern and made 9 individual versions of it - stretching and centering them until the space behind the dollhouse cabinets was filled. That gives me my template for any other videos - I will build other videos in a layer above this, and then hide the test patterns for export. Now that I have the electronics strapped to the back and tunneled into the box, I can begin building the rest of the frame around the screens. Bass wood! The screen goes blank between each video, revealing the command prompt and Unix output; I'd love to hide that. If I could install a switch triggered by the opening and closing of the Pataphysical Slot Machine, then maybe I could trigger the sound to shut off by default, and play when the door is open - thanks for the idea Donald Day! I learned about the excellent video/sculpture artist Tracey Snelling from Freddy Hahne. After some research it seems she uses DVD players as the source circa 2010. I have much less real estate to work with. She was helpful and forthcoming over email with suggestions! I asked on Adafruit how I might use a Raspberry Pi to play multiple video streams to multiple video monitors. This lead me to Ask An Engineer, where I saw Limor and Phil again after 8 years. Hah! Excellent - they took my question from chat. 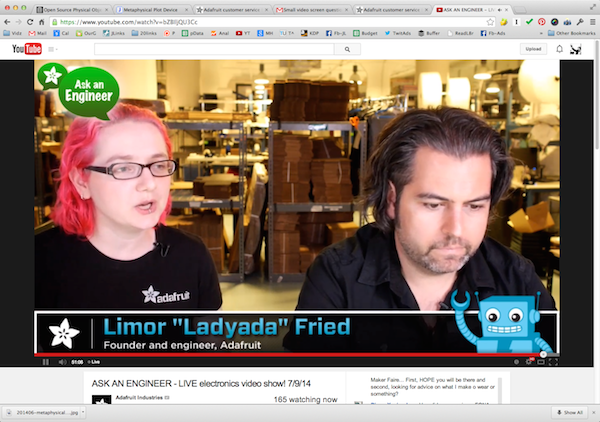 Fun to see these folks working through AdaFruit to promote open source hardware and human creativity!